People tell you that the best thing about solo travel is the absolute freedom that you have – no worrying about having to accommodate anyone else’s schedule but your own, or being able to change your mind on a whim, just because. All that is well and true, but despite that, the one thing I find perpetually challenging is having to dine on my own. Which is weird because given my long work hours and that my family generally likes to eat earlier in the evening, I usually eat dinner at home by my lonesome anyway, but perhaps it comes from a lifetime of communal Chinese meals and that sense of community you get from sitting at a table together and sharing food, I’ve always found dining solo when travelling a little challenging and a tad lonely. I’ve gotten a lot better at it – I can sit in a foreign restaurant on my own and order food much more comfortably now then when I first started travelling solo, but I still tend to avoid really crowded places and keep myself occupied by either reading or journalling. Some days I’ll just buy take out or hit a supermarket, and then find a random corner to picnic in or hide in my room to eat just because I don’t feel like dealing with dining alone. I managed to find company in Tavira, so it was only when I hit Porto that I had to actively figure out most of my meals on my own. I stayed in a lovely private room at the Poets Inn, which was an amazing place to kickback at the end of the day but didn’t give me that much chance to meet new people – the private room was in a separate building from the rest of the hostel and they didn’t organize any of their own tours. I did join a bunch of other walking tours and made some friends then, but somehow at mealtimes I was mostly on my own. 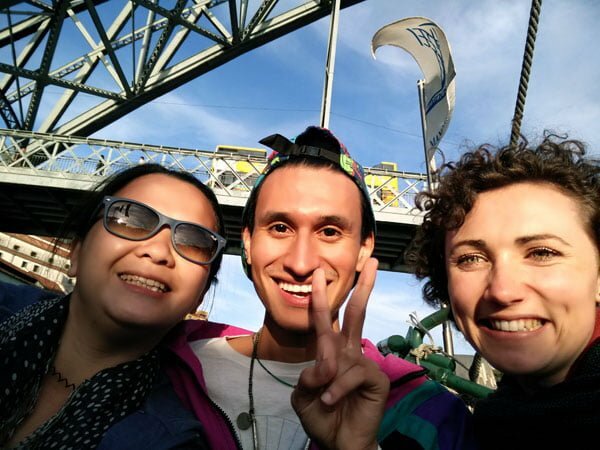 My priority on trips is usually to sightsee, so with limited time, I sometimes put off my mealtimes or eat on the go, which is harder to do when you’re travelling with other people and have to take their welfare into consideration. Not having to worry about anyone else’s palate also means you can eat whatever you feel like without worrying about whether you’re depriving your friends from something they wanted to eat. 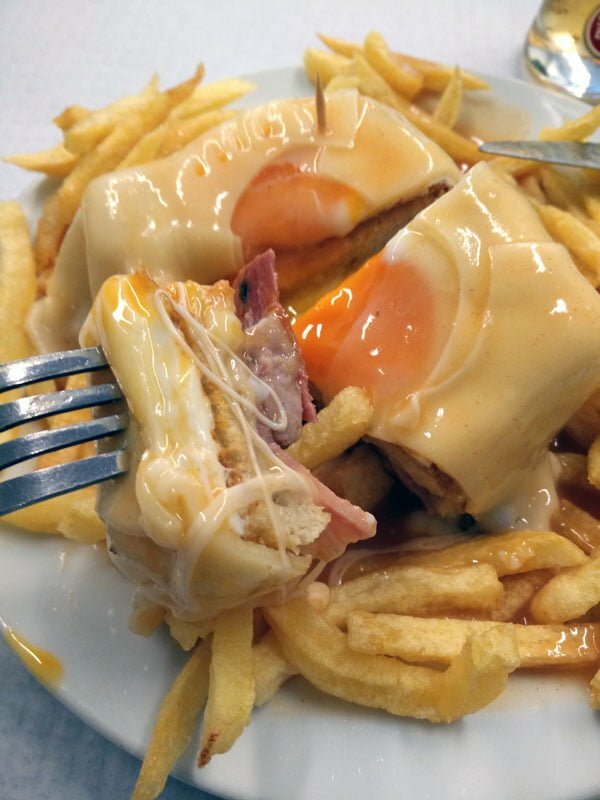 Francesinha is a behemoth of a meat sandwich – it has pork, sausage, steak, ham all topped off with cheese, egg and a boatload of fries. 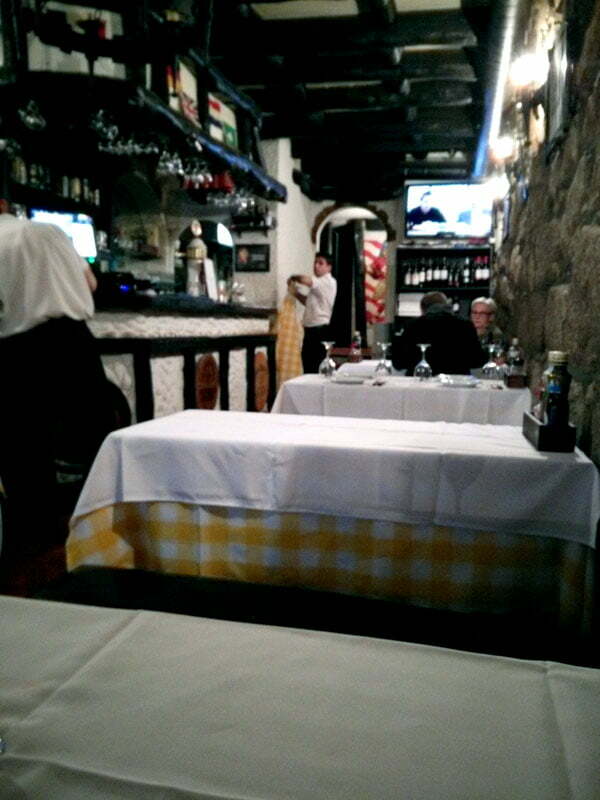 It is a Porto specialty and Cafe Santiago specializes in it so you have to go eat it there. I had to eat this amazing Franescinha dish at the popular Cafe Santiago on my own. 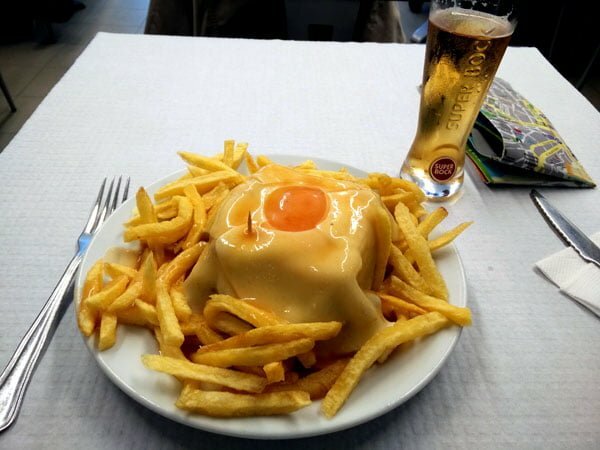 The meat-cheese-egg combo was staggeringly delicious but the portion was hefty, and while I think I did quite an admirable job on finishing the dish, I also felt a little bit like exploding after that. Definitely no room for dessert after this! 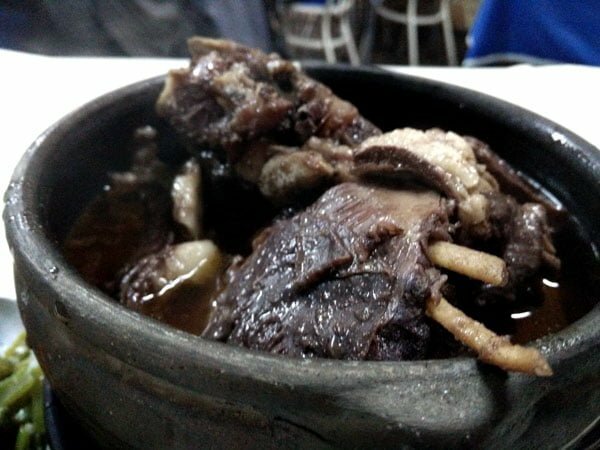 A close up view – look at all that meat! And having a whole bottle of wine by myself? Drinks definitely need company to be real good fun – drinking a whole bottle of port wine on your own, no matter how excellent, is just never as good. 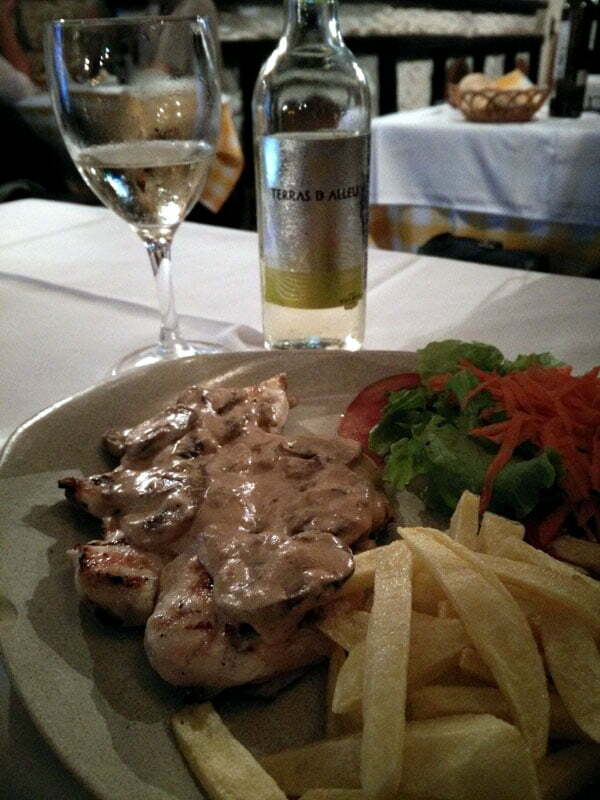 I wasn’t expecting to make any friends when I decided to dine along along the Douro river stretch in Vila Nova de Gaia, but as I savoured a very non-Portuguese meal of mushroom sauce chicken, the lovely J and S who sat in the next table from me in Porto struck up a conversation with me, which made dinner a lot less lonely. I would meet them again by chance the following day at Livaria Lello. That same night after J & S departed, I ended up chatting up a merrily rowdy trio of travellers who took over their table as I was finishing my own meal, something I’m pretty sure I wouldn’t have done if I had a dinner companion of my own. I ended up joining their table that night, which led to quite a lot of laughs and port consumed. We even made vague grand plans to rent a car and head out to the Douro Valley, but at some point sobriety kicked in and I figured there was no way they were gonna wake up the next day from all that drinking (they departed to go dancing when I begged off to head back… and I was proven right the next morning), but it was a fun night while it lasted! This was glass #6 – Port is deceptively sweet and makes you forget that it’s actually close to 20% alcohol – you can’t help but have a great time on a walking tour that involves copious amounts of port! 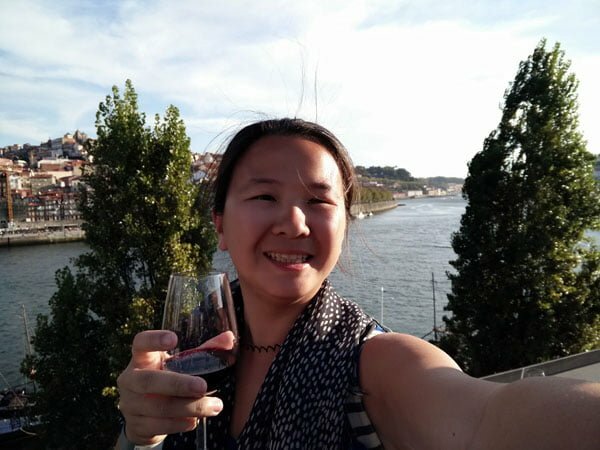 Then there was the Port Wine Tour I took with the Wild Walkers which brought us to the Ramos Pinto Wine Cave, followed by a visit to Porto Cruz, capped off with a sunset boat ride along the Douro River and a little fado at the end. 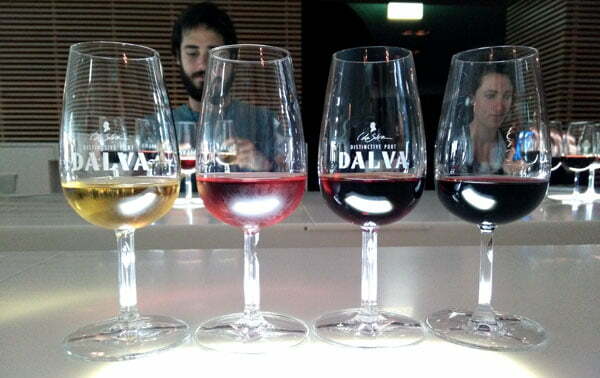 I had 7 glasses of port and trust me when I say, people became real fast friends after the first few glasses :) We went for a huge group dinner later that night – though I don’t have any pictures of that! Of course the lesson from all this could also be that alcohol is a great tool in the friend-making department, but you’re still more open to making friends when solo, alcohol or not. You can always tell when the Asians are in a restaurant because at some point, plates are going to be passed around and all the food at the table gets tasted. I personally enjoy eating meals as a group because by sharing, you get to order more food and have more variety, which is hard to do as a single person with a smaller budget. Also, I don’t eat a lot to begin with, so variety is hard when I’m on my own. Me and Y at Principe do Calhariz in Lisbon – on top of this we had table sausage and a fishcake-looking cheese for sharing. But if you are a small eater like me, it could result in savings just because you order smaller portions or you just don’t eat as much to begin with, and those savings can go to other things you might deem more important than food. Not that I’m unadventurous when eating with company – but one thing I like to do when I dine on my own is to get the waiter to recommend a favourite dish or house special. I am a notoriously picky eater but somehow I find myself being a little more daring when I’m on my own. 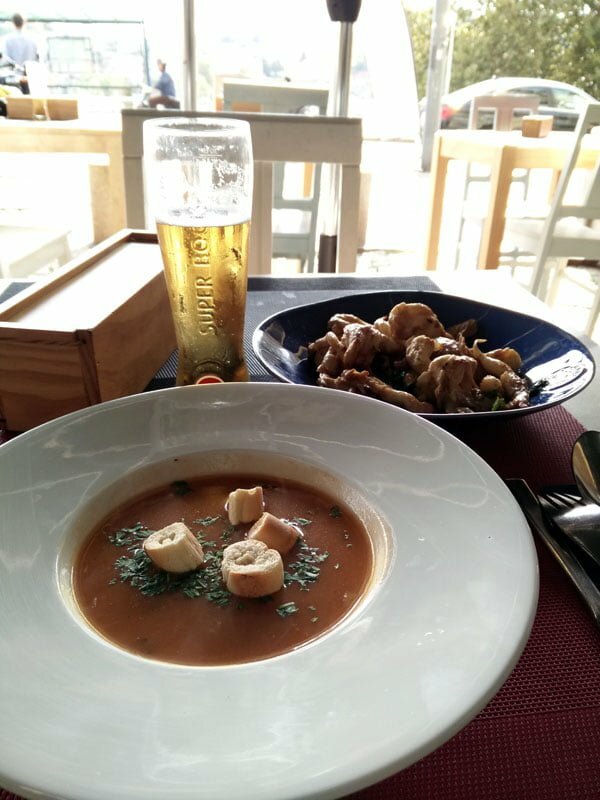 So far it’s been an interesting experiment – that’s how I ended up ordering Chanfana (a Lamb, or according to the waiter – goat stew) while in Coimbra because the menu was entirely in Portuguese and that’s what the waiter recommended. 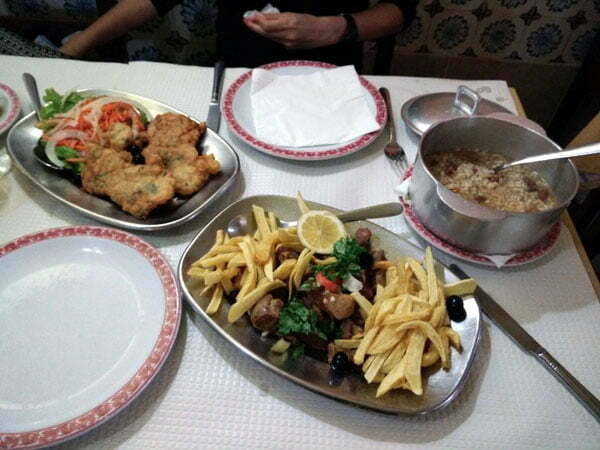 I didn’t love-love it – the soup/stew bit was kinda oily but it was a Portuguese specialty and rather unusual. 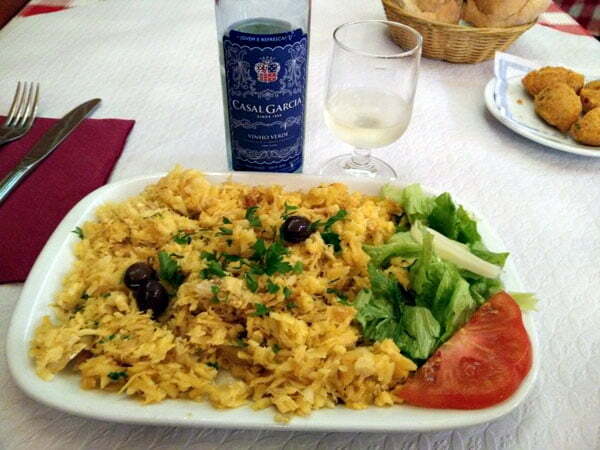 And in yet another restaurant when I returned to Lisbon, I decided on the Special of the Day Bacalhau a bras, which is their famous cod shredded and mixed with potato, also recommended by a helpful waiter. Meals are a great time to commune, and after an awesome day of travels, it’s nice to take a break and reminisce about the day over good food and drinks. Solo dining opposite an empty seat may be a nice way to collect your thoughts on your own, but I personally like being able to have a conversation with someone. I usually use the time waiting for my order to arrive to either people watch or catch up on journalling, and if all fails there is the phone and wi-fi to catch up with friends instead! 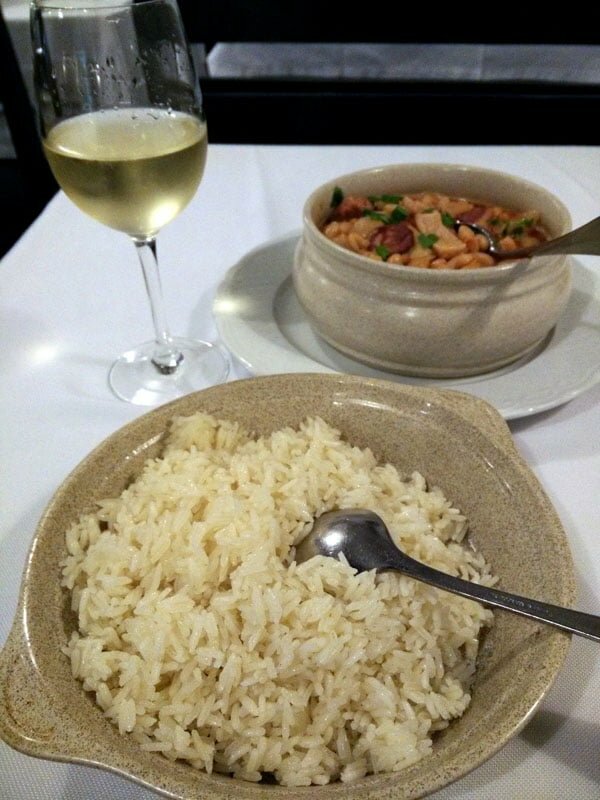 How do you feel about dining solo on your travels? 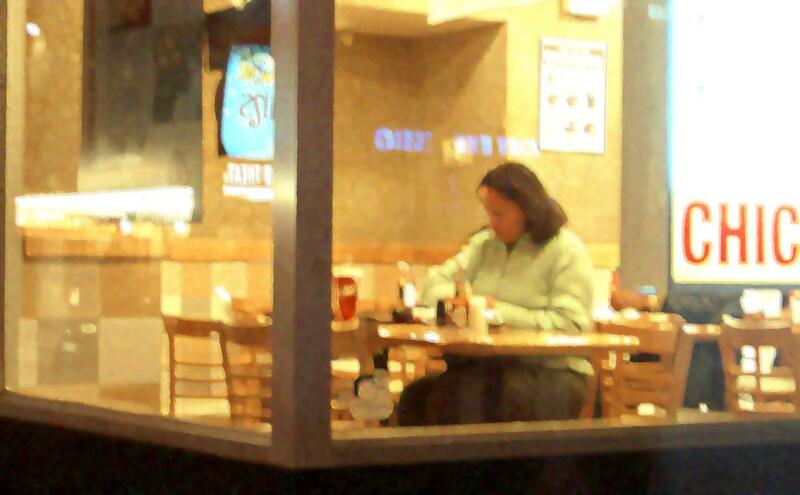 Are you cool with being a table for one, or wish you didn’t have to do it? As for me, I tend to eat more when I am with other people. If I’m all by myself, I can do with salad. But what I love about eating alone is that I can eat as long as I want. When I was working in an office all day, I usually preferred to eat lunch alone—I’d read the paper, pay bills, whatever. I haven’t had to deal with eating out alone too much otherwise. I think I’d probably end up in very low key places and perhaps miss out on some of the better cuisine at fancier restaurants. It sounds like you manage quite well and as you mentioned, when you approach a restaurant meal alone, you have the opportunity to meet more people than if you’re there with a companion. In the office I usually prefer to eat with colleagues, though I have days I just want to be alone! And yeah I definitely tend towards low-key restaurants on my own like you, so that’s us missing out on fine food I suppose :P maybe one day I should attempt eating at some fancy restaurant on my own! I am a huge fan of dining solo. But with husband in toe it’s a rare occurrence of late.